Mazar by Dutch Passion is perfect for anyone wanting to make hash at home. It’s well rounded and solid genetics exemplify everything that is right about the older generation of cannabis strains. Mazar by Dutch Passion is an old-school classic that still remains popular to this day. Dating back to the 1980’s, the Mazer strain was the outcome of breeding an exemplary specimen of Skunk #1 with a potent Afghan strain. 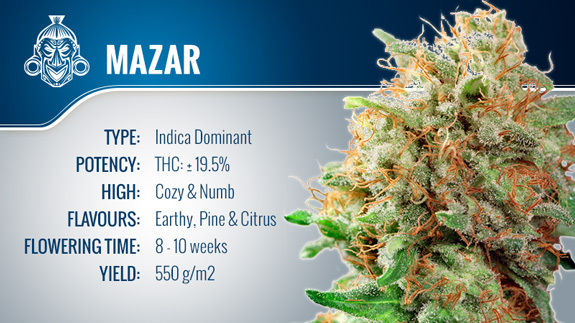 Becoming an instant hit with the cannabis community, Mazar was then later improved upon with stronger genetics in 1997. The fact that this time-honoured legend remains so popular is a testament to its quality. The name itself comes from one of the biggest hash producing regions of the world – the Mazar-i-Sharif area of Northern Afghanistan. As you can probably imagine, the Mazar strain of cannabis stays true to its namesake, and is perfectly suited to hash production. We found Mazar to have a sweet, yet earthy taste and aroma, bringing forth hints citrusy pine flavours. It is a flavour that hallmarks an Afghan strain, and will certainly be enjoyed by the hash lover. Being slightly indica dominant, Mazar’s high is mainly physical, relaxing and easing the body; but it also induces a calm and meditative cerebral high as well, allowing for 100% total relaxation. As you can probably imagine, we found this high best suited to when you don’t have much going on, like at the end of the day, or when you are kicking back and getting lost in some music. 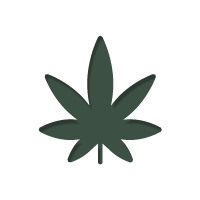 It is worth noting, the THC content of Mazar is around 20%, making it very potent. Unfortunately, the CBD content of Mazar is unknown to us, so we can’t really comment on any real medical potential. However, anecdotally, Mazar is meant to excel when it comes to pain relief. When it comes to growing Mazar, we were pleasantly surprised with its simplicity. It is an extremely resilient grower, and has a bearing of toughness that will appeal to novices who are not too confident in their skills yet. Mazar grows with a Christmas tree like stature, remaining short but exhibiting vigorous side branching – helping produce a large harvest. The flowering time was roughly 9 weeks, and it produced some extremely generous yields of large, sticky bud. We found that the resilience offered by Mazer also had benefits for the more experienced grower, especially those looking to learn or improve on their advanced growing techniques. This flexibility means you are free to experiment without too much worry of over stressing your cannabis – although it will only put up with so much. Despite being so old, Mazar is still an extremely popular and potent strain of cannabis, making it a testament to the breeding prowess of Dutch Passion. The powerful mind and body high, combined with its exemplary growing traits, and its ability to produce world class hash makes it an absolute pleasure to grow. If you want to try something old-school that still has the punching power to rival today’s hybrids, then Mazar maybe the one for you.